In a previous post, Boutros discussed the top free offline desktop editor for your blog. In this post I will elaborate further… As bloggers, I think it is pretty safe to say that we are always trying to find ways to make our jobs a little bit easier. Any shortcut comes greatly appreciated because crafting quality blog posts takes a fair amount of time and effort. One way to make writing blog posts a little easier is by utilizing Windows Live Writer, a desktop blog-publishing application, developed by Microsoft. There are several perks for Windows Live Writer. Blogging professionally can get expensive. There are all sorts of hidden fees you don´t think about when you first embark on the blogging adventure – buying a domain name, hosting fees, finding and retaining a good Web designer, learning how to do Web design and Web development yourself … and the list goes on. So any tool that is free and actually useful is a definite plus. One of the biggest perks of Windows Live Writer is that it allows you to craft blog posts even when you don´t have an Internet connection. So if you are suddenly struck with one of those phenomenal post ideas but can´t access your Website, here is the solution. It allows you to draft a post and save it until you are able to go online and publish your post. 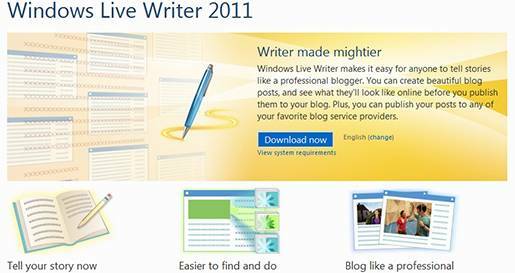 Whenever you published a blog post, Windows Live Writer will ping all major search engines. This way your post will appear much faster in search results. This is a great feature in terms of getting your blog more traffic, and it takes some of the promotion work from you. Images are, in my opinion, one of the most important parts of in-depth posts. They allow the blogger a chance to breathe in between long-winded thoughts, and give the reader a much needed content break. However, anyone using any of the standard blogging platforms knows that it can be a very long, drawn out process to add images to posts. However, with Windows Live Writer, uploading multiple images is nearly painless. Windows Live Writer also gives you more options in regards to font, text size, and many free plugins. Every blogger knows how important plugins can be for blogging – they allow you to customize and extend the functionality of your blog, so having access to more of them make perfect sense. Windows Live Writer also syncs with your blog´s design, allowing you to preview it offline as you would online, and it also imports the previous 500 posts from your blog. Are you not satisfied yet? Windows Live Writer offers a wealth of other features such as: WYSIWYG authoring, video and map publishing functionality, time stamping, tagging, categories, spell checking and more. It enables instant previews and I also like the source view screen. And best of all, It supports multiple blogging platforms such as WordPress, Share Point, TypePad and Blogger. The only drawback for Windows Live Writer is that it only supports Windows Operating Systems. No luck for Unix/Linux or Mac users! But there might be a workaround for Linux users, and the same idea can be applied for Mac users. If you have something to add or anything else to say about Windows Live Writer, please share your opinion in the comments section. Your opinion matters, unless it is a Spam. Kate Croston is a freelance writer, holds a bachelors degree in Journalism and Mass Communication. She writes guest posts for different sites and loves contributing cheap internet service related topics. She welcomes your questions or comments. Nice to read this article. I have not used this application before. I need to try out after reading the article I feel so. It might be an asset for my Video conferencing blog. Thanks pepsharada for your comment. It will make blogging much easier, I definitely think you should give it a try!